Entertaining Elliot: Drumond Park's Gross Magic - Review & Giveaway! With Halloween just around the corner, Drumond Park have the perfect thing to whip out at your Halloween party to impress your friends! 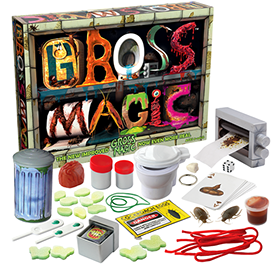 Gross Magic (RRP £19.99) is a fun set for children 8+ featuring over 40 tricks to thrill and gross out your audience. Featuring tricks containing yucky things like cockroaches and poo, this is bound to appeal to kids of all ages! My husband is a big magic fan and it's a love he has passed onto Elliot. We've seen the legendary Penn and Teller in Vegas and Elliot recently took part in a magic show whilst we were on holiday in Majorca! We've had magic kits before but nothing quite as gross as this and the boys couldn't wait to test it out! The magic kit was a little too old for Elliot as he is only 3 and the tricks take a bit of reading and practising but he enjoyed helping his Daddy out. The first trick they did involved bogies - there is a literally a whole section devoted to bogey tricks and this definitely appealed to their sense of humour!! Some of the tricks do seem quite tricky to master so I would definitely recommend having an adult to help out but there are so many tricks to try out that I'm sure as your magic skills improve, you can work up to the harder ones! The boys have spent lots of time perfecting their tricks and I can't wait to see what they come up with next! It was Paul Daniels - I grew up loving him! I grew up watching Paul Daniels - he was a legend! Dynamo - really enjoy watching him on TV. Derren Brown is my favourite. It has to be the much missed and loved Paul Daniels. I'll say Dynamo, I'm not up on magicians, but he is one that I have watched quite a few times on TV . Jester Styles from Coventry is my favourite magician. I like Derren Brown because you're never sure what's psychological and what's old-fashioned sleight of hand. Dynamo - this guy is utterly amazing! I love Dynamo, some of the things he has done absolutely baffle me! Paul Daniels, he was a brilliant children's entertainer as well. Impressive! This article website shows up specifically like my aged one! This jumps on an entirely various subject nonetheless it has usually the precise comparable web websites design together with layout. Remarkable possibility from tones!